My father-in-law sent me this picture yesterday and asked if I remembered the moment. I can’t say that I do. I know it’s Piper. I think it’s our house in Florida but it could be Illinois, too. I know that she looks around a year old, so we were packing our house. Again. I know I was still nursing her. I know I’d quit a perfectly good job that I loved to be home with her, which required another cross-country move so that her Daddy could support us. But I don’t really remember. The lean years of juggling babies, bills, and school on graduate student stipends are a blur, mostly. I’m glad for the picture. I’m glad I let Piper drag everything from the cabinets and explore. 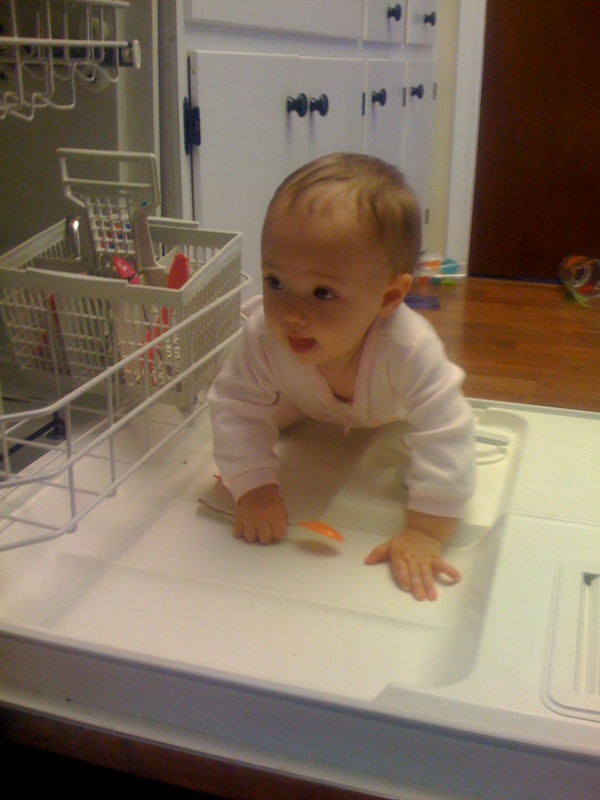 I’m glad I let her crawl on the dishwasher for fun. I’m really glad she didn’t break it because I know we couldn’t have afforded the repair. I’m glad I was there even if my memory wasn’t. I asked my partner if he remembered it. He agreed that that time was a blur. “We let her do that?” he asked. “Apparently, you did,” Sissy agreed. I was there. Right there. Even if my mind wasn’t. This entry was posted in Blasts from the Past and tagged misbehaving, parenting, parenting blur, piperism by melissa.scholes.young. Bookmark the permalink. thank goodness for this post – I was trying to remember some of my kids’ early days and could not recall them – glad I am not the only one – sometimes do you want to turn the clock back so you can relive some things better? I know I do. My husband and I joke that the videos we take of the kids brainwash them into believing every moment of their childhood was awesome. No one picks up the camera at my bad parenting moments, right? So the videos are all sunshine, lollipops, and rainbows. That’s all they need to know! and no one blames you! Thank you! The blog is my redemption.